Another fabulous Lyle and Scott Rucksack is ready to giveaway to one of you lucky, lucky people. Who Wants To Win This Little Tweet? To enter this fantastic giveaway, all you have to do is the following. Click the tweet above, follow @apachehorsham and Retweet to be entered in the draw. As always, we like to give you all as many opportunities to win our amazing giveaways, so here is another. How Much Is This Lyle and Scott Rucksack? This is the stunning BA004V02 Lyle and Scott Rucksack, available at Apacheonline in this classic Deep End Blue colour way. It is expertly crafted in a strong and durable cotton canvas fabric, featuring multi functional interior and exterior compartments. So not only very useful for college or the gym, but you will definitely look the part with this on your back. For an extra entry into this fantastic competition, here’s what to do. 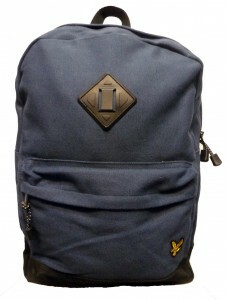 How much does this Lyle and Scott Rucksack Cost At Apacheonline? Simply subscribe to our blog and comment your answer on this post to gain an extra entry. So, a big thank you to all the guys at Lyle and Scott for this amazing prize and a massive thank you to all of you who have already followed and retweeted. Whilst you all tweet tweet tweet, why not take a look at the latest arrivals of Lyle and Scott at Apacheonline, simply by clicking here. If you also get another minute, take a look at the this great video of the opening of Lyle and Scott’s New Carnaby Street Store. Lyle & Scott Carnaby Street Launch Party from Lyle & Scott on Vimeo. Hi Stu, Now that was quick!! Your extra entry has now been counted, Good Luck!! its 45GBP, i’m already subbed, is that ok? Hi Elle, that is fine, your extra entry has been counted!! Good luck! Hi Mark, thank you for your comment and your extra entry is in the hat! Fingers crossed! It’s £45.00 and I’ve subscribed. I look forward to reading your blog. Hi Sheryl, thanks for your comment. Your extra entry has now been counted, good luck!! The Lyle and Scott Rucksack is £45.00 and I have subscribed as annaloa_hilmarsdottir@yahoo.co.uk. My twitter handle is @Cosmonauty and I have retweeted. Hi Annaloa, Your extra entry has now been counted, good luck!! Thank you for your comment David, your additional entry has now been counted, keep those fingers crossed! The Lyle and Scott Rucksack is £45.00. I have subscribed to your blog. Thank you for your comment Annaloa, you’re extra entry has now been counted, good luck! Hi Andrew, thanks for your comment! You’re extra entry is now in the hat, good luck!! Hello Faye! Thank you for you’re comment, you now have an extra entry, good luck! Hi Melanie, thanks for your comment, good luck!! Thank you Buck, you’re extra entry has now been counted, good luck! Thank you Jacqueline, you’re extra entry has now been counted, good luck! Thanks for the comment Samantha, you’re extra entry has now been counted, good luck!! Thanks Paul, we think so too! Good Luck! !